I recreated one my favorite cookie of all time, and trust me folks. Now when it comes to cookies, I have admitted on here before that I’m usually a bit of a minimalist when it comes to chocolate. Yes yes yes, I like it, but somehow I missed inheriting that intense chocoholic gene that 99% of women (yes, and many men) seem to have. So I will eat and enjoy occasional chocolate chip cookie or chocolate bar, but one or two bites is always enough for me. My neighborhood coffee shop started serving these big beautiful caramel white chocolate cookies about a year ago. And I must say — when judging a book by its cover (ok, an entire case of various cookies), this cookie was always the most beautiful. Granted, its caramel swirls are baked in, and the cookie is about the size of your head! But after staring at these cookies for months, I finally decided to try one with my coffee one day. And I absolutely fell in love. I don’t know if it was the caramel. Or the white chocolate. Or the inherent magic that somehow seems to burst forth with a bite of these cookies. But they pretty immediately surged to the top of the list of my favorite cookies, and have been there ever since. So after paying $3 a cookie at the coffee shop for a year for this heavenly sweetness, I decided it was finally time to try and make a version myself at home. And what better excuse to try out a new cookie recipe than for the 2013 Great Food Blogger Cookie Swap! The swap — organized by my talented friends Lindsay and Julie — invites food bloggers from all over the country to create new cookie recipes, mail them to three bloggers that they are randomly paired with, and then blog about the recipe so that the entire world can share in the (literal) sweetness. I participated in the event last year and loved it, so was excited to be a part again. Although thanks to some kitchen remodeling delays, my cookies are arriving way late this year (sorry food bloggers!). But hey, better late than never when it comes to cookies, right?! Ok, so for the cookies, all I did was mix up some basic cookie dough. 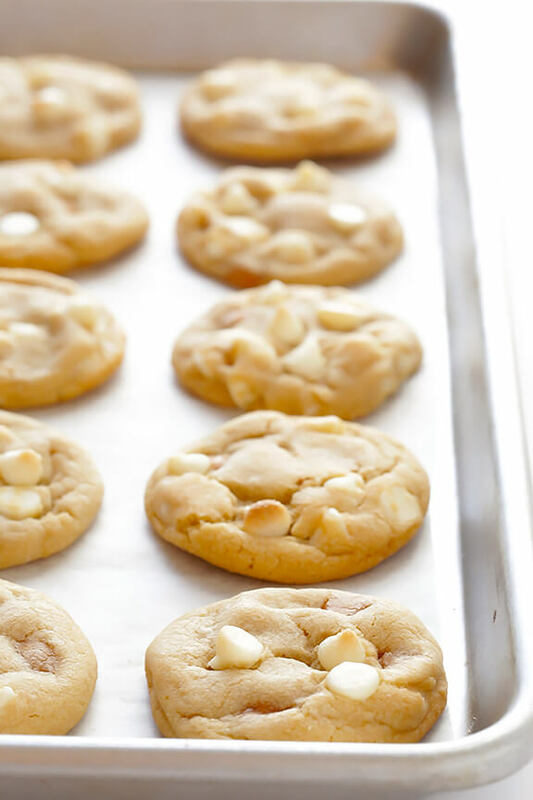 Then I mixed in a bunch of white chocolate chips and caramel bits (you can find them in the baking section next to the chocolate chips), and then baked them up to soft and chewy perfection. And that they were. I want to mention that these cookies could totally stand on their own just like this. Delish! 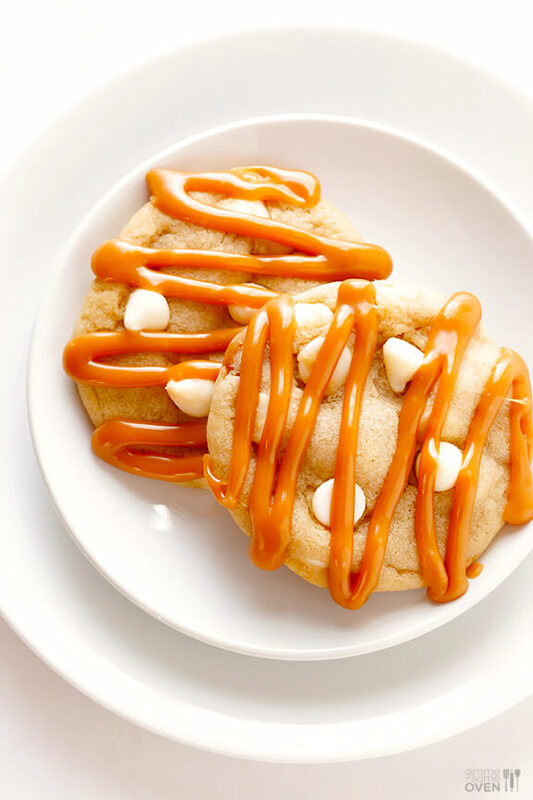 But if you really want to go the extra mile, which I of course recommend, these cookies are pretty much epic if you take the time to top them with some caramel drizzle. You can either make homemade caramel sauce from scratch, or just melt down the leftover caramel bits to make a caramel sauce. I mean, just look at those little works of art. Who can argue with a caramel drizzle?!? I apparently can’t. Because I have been eating the leftover cookie swap cookies (yes, I made a triple batch after the first test batch) for breakfast lunch and dinner, and still have not grown tired of them. The sweet white chocolate paired with the salty caramel is just perfection in my book. And a nice chewy cookie makes any day better. 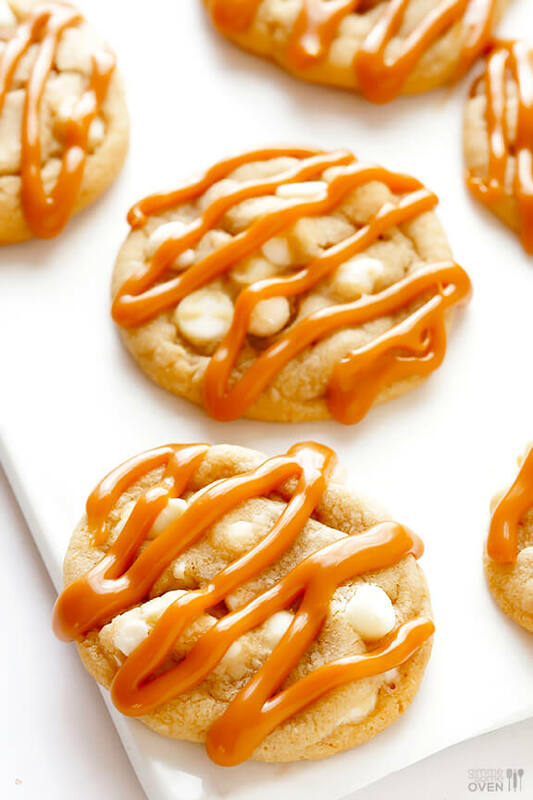 These caramel white chocolate cookies are my new favorites. Seriously. Using an electric mixer with the paddle attachment, cream together butter and sugars on medium speed until light and fluffy, about 2 minutes. Add egg and vanilla and beat in until combined, scraping down the bowl partway through. In a separate bowl, whisk together flour, cornstarch, baking soda and salt until evenly mixed. Add mixture into the dough, and beat on low speed until combined. Fold in chocolate chips and caramel bits, and stir until just combined. Measure dough into rounded tablespoon-fulls, and roll into round balls. 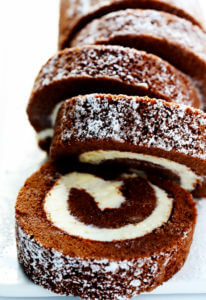 Place on a parchment-covered baking sheet, and dot with extra chocolate chips if desired. Repeat with remaining dough. Then transfer the cookie sheet to the freezer and chill for 10 minutes. Transfer sheet to oven and bake for 8-10 minutes, until the tops of the cookies ever so slightly begin to brown. Remove pan and let rest for 5 minutes. Then transfer cookies to a wire rack to finish cooling. Repeat with remaining dough. 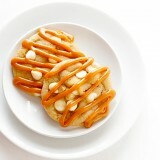 Once the cookies have reached room temperature, drizzle with caramel sauce if desired. 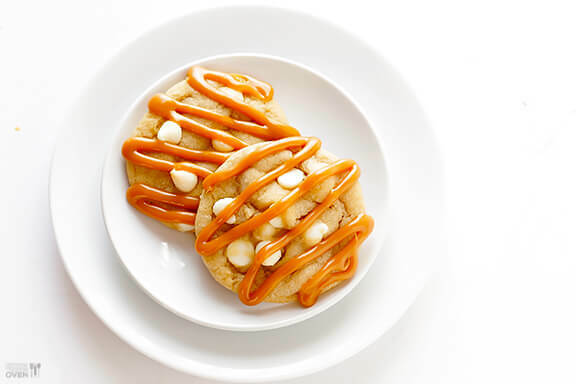 You can do this by dipping a fork in the caramel sauce and swishing it back and forth over the cookies. Or you can transfer the caramel sauce to a piping bag or ziplock bag and drizzle that way. Store cookies in an airtight container for up to 5 days. Storebought: I recommend buying the caramel sauce in the tubs (for caramel apples) and warming it a bit for drizzling. I don’t recommend the caramel topping for ice cream. Melted Caramel Bits: Follow the instructions on the bag for melting caramel safely, as it can burn. Or just add caramel bits to a microwave-proof bowl with a small splash of water or cream. Heat in 20 second intervals, stirring between each, until caramel is melted. Add more water or cream if needed to thin. Base cookie recipe adapted from Anna Olsen http://www.foodnetwork.ca/recipe/chocolate-chip-cookies-a-la-anna-olson/2633/. These look incredible, Ali!! 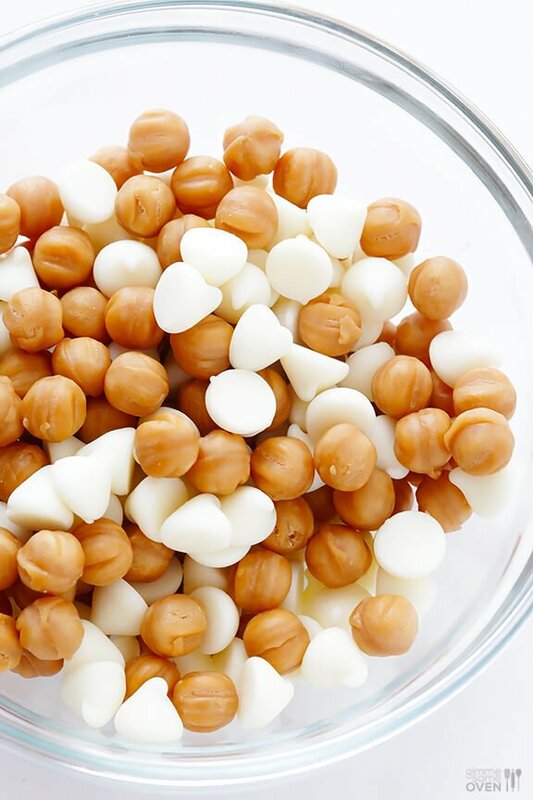 The caramel with the white chocolate is such a great idea! these look amazing! I was hooked when I saw white chocolate AND caramel. I can see why you ate these for breakfast:) LOVE! That drizzle sets these over the edge, in a good way. These are beautiful! I am huge fan of white chocolate! These look unreal! I so want to taste them! Holy heaven, do I ever need a few of these! If you want to do another cookie exchange, I’m in! Love the caramel drizzle! I’m craving a big batch of cookies right now! These sound and look like winners! Love love the caramel drizzle! These look and sound amazing! Definitely a combination I need to try! 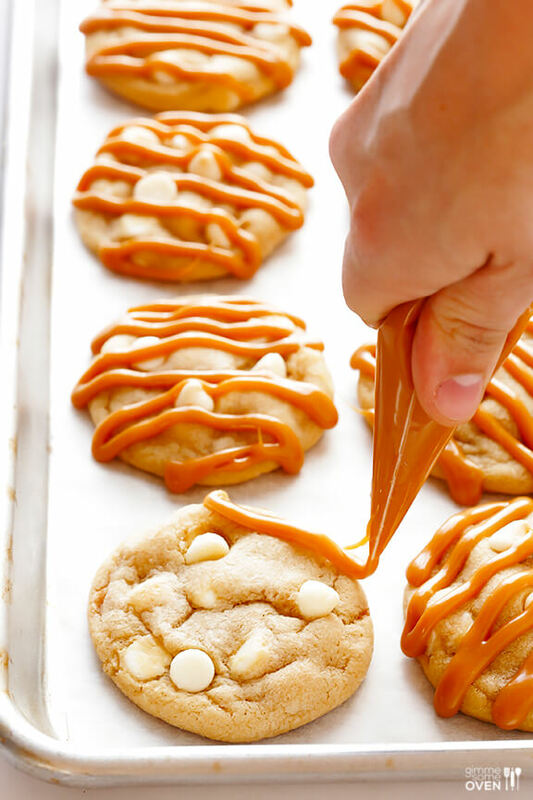 Love these cookies – I can never resist anything involving caramel. Add some white chocolate in there and I’m totally sold. They look amazing! I can’t wait to get my package :) I’m putting coffee on as soon as the mail gets here! Oh my this sounds like an amazing cookie! I just made these last night, and they are delicious! I’m not a big fan of white chocolate, but I can’t resist anything made with caramel. For fellow caramel lovers, I highly recommend the drizzle on top. Just for kicks, I added chopped pecans to part of the batch. Both the regular cookies and the ones with pecans were heavenly! These are amazing! I’ve had the recipe saved for almost a year and am kicking myself that I didn’t bake them sooner. They are so soft! Is that the corn starch? White chocolate and caramel is so much more subtle than milk or semi-sweet would have been. Excellent cookie! I stumbled upon this cookie recipe a couple years ago, and since then it has become my #1 cookie recipe! Sometimes I add nuts, or leave off the caramel, or just use chocolate chips. I’ve used this recipe when making cookies for special gatherings, and it never fails that someone asks me to share the recipe with them! Thank you so much for sharing this. Hi Benjamin! Yes, it just helps prevent the cookies from spreading. We hope you enjoy them! Yes, definitely! We hope you enjoy!